While President Trump refused to be drawn into just another Punch and Judy show with North Korea and China, he also launched a process to awaken the famous American industrial sleeping giant. These are Japanese Naval Marshal General Isoroku Yamamoto’s prophetic words after the attack on Pearl Harbor. President Trump just initiated Section 232 of the Trade Expansion Act of 1962 which might well play such a role as well. Section 232 of the Trade Expansion Act of 1962 (19 U.S.C. §1862) authorizes the Secretary of Commerce to conduct comprehensive investigations to determine the effects of imports of any article on the national security of the United States. The Secretary shall immediately provide notice to the Secretary of Defense of any investigation initiated under this section. if it is appropriate and after reasonable notice, hold public hearings or otherwise afford interested parties an opportunity to present information and advice relevant to such investigation. Upon the request of the Secretary, the Secretary of Defense shall provide the Secretary an assessment of the defense requirements of any article that is the subject of an investigation conducted under this section. As expected, the leadership of the one party rule dictatorship that personifies today’s Peoples Republic of China, did not even attempt to stay on the civilized side of grand hypocrisy when the President made his announcement. It is a profound American trait that along with our eternal optimism, we simple hate hypocrisy. President Trump just threw the PRC’s “16 Character Policy” right back in their face. 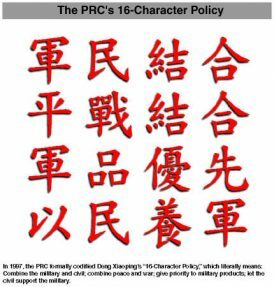 This is because the driving principle of the “16 Character Policy is that everything the PRC does as a nation is to combine the military and civil into a seamless capability. It is way past time that an American President stands up for our forgotten industrial workers ignored by both the Republican and Democrat Trade Spin Doctors. “.. the “Blue Team”–a loose alliance of members of Congress, congressional staff, think tank fellows, Republican political operatives, conservative journalists, lobbyists for Taiwan, former intelligence officers and a handful of academics, all united in the view that a rising China poses great risks to America’s vital interests. A decade later the respected magazine Wired asked a simple question about the American China relationship after our trade policies decimated American industry. In essence did the Blue Team fail? A millennial focused magazine of note, Wired built out from the Washington Post article but was less sanguine in asking a profound question: Where have all the China hawks gone?